So I decided to tune into the Thursday night game last night for one reason and one reason only… to observe Robert Quinn. It is painfully obvious that our biggest need this offseason will be to ignite our anemic pass rush, particularly at the RDE position currently occupied by the consistently overhyped, overweight & overpaid Will Smith. While I understand that Quinn is currently playing under Jeff Fishers scheme, He was Spagnuolo’s guy. At the time of the Rams selection of Robert Quinn the Rams were very much in a similar situation under Sags that we find ourselves in now. They had a very good base LDE with potential in Chris Long, much like we have in Cam Jordan. While I understand that Long is the better overall player and better pass rusher of the two, Jordan in his own right is the better run defender and possesses the ability to pressure the QB and he like Long is a converted college 34 defensive end and like Long is progressing and getting better and better every year. The problem Sags had is St. Louis (amongst many others) was he had no one opposite Long to turn the edge and take pressure away from Howie’s boy. Heading into the 2011 NFL draft Spagnuolo coveted the 6’5” 265lb Quinn to fill the void on the right side of his defensive front. What makes Quinn different from a lot of other elite defensive pass rushers Sags has coached in the past when looking at it from a Saints perspective is the fact that Quinn was handpicked by Spagnuolo as the head coach of the Rams at the time making Quinn and his skill set the basis of what Sags, Payton and Loomis will be looking for in this upcoming draft. Spagnuolo set his sights on Quinn in 2011 to help fix a similar problem then that he’s currently dealing with now in Nawlins. In spite of off field issues and character concerns the Rams selected the former Tar Heel with the 14th overall selection which leads me to last’s nights contest. 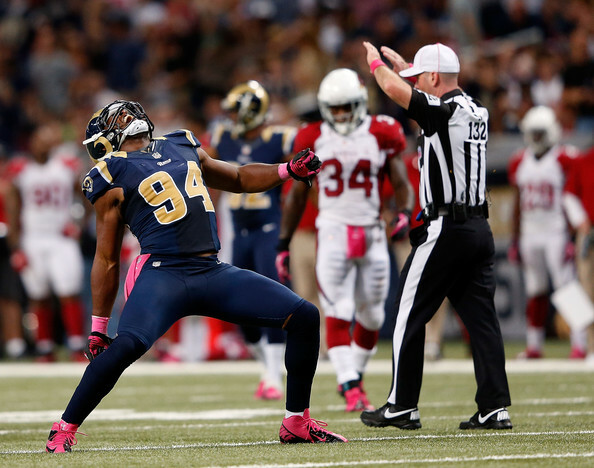 Anyone who watched that game last night could not come away feeling that Robert Quinn was arguably the best player on the field. He constantly used his tremendous get off and speed to turn the edge and collapse the pocket around Kelvin Kolb. Quinn harassed Kolb all night and amassed a total of 6 tackles, 3 sacks, a forced fumble & numerous pressures that lead to sacks by fellow Rams teammates. This is the vision Sags had when he drafted the kid. He knew the potential he possessed and the affect one elite pass rusher can have on a defense. I look for the Saints to really focus all of their efforts in this upcoming draft to find their version of Robert Quinn in which Steve Spagnuolo will have a major voice in the process. With that being said, I decided to try to look and compare all of the 2013 NFL draft incoming edge pass rushers to Quinn’s skill set coming out of North Carolina to see if maybe I could get into the mind of coach Sags and predict which direction he could possibly go come late April. The following are the top 3 logical targets of the incoming crop of pass rushers whose game compares favorably to Quinn’s coming out of UNC. Montgomery’s game in my opinion mirrors Quinn’s the most of all the pass rushers available. They have similar size, build, athletic ability and burst coming into the league. Both players were and are considered quote unquote “tweeners” coming out of the college ranks and both benefited greatly in college from playing alongside other dominate collegiate defensive lineman. Montgomery, like Quinn possesses the rare ability to dip the opposing tackle’s shoulder while staying balanced and turn the edge to collapse the pocket around the QB. They both use their speed to put offensive tackles on their heels and possess deceptive power. Both showcase an impressive array of pass rushing moves for a college player and are high motor energy players. In my opinion… Sam Montgomery would likely be (like Quinn was in 2011) the top choice on Spags wish list come draft day. While this pick my not be popular by some, remember this list is based on my overall comparisons to the skill set of Robert Quinn as a draft prospect. While at 6’5” 254lb Jeffcoat lacks a little of the bulk Quinn had he easily possesses the frame to add an additional 10-15 lbs without losing any of the burst and athletic ability that makes him compare favorably to Quinn. 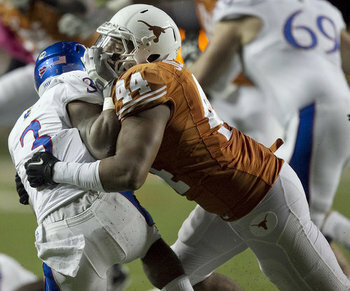 Jeffcoat explodes of the ball and immediately puts tackles in catch-up mode. He is an elite pass rusher who can turn the edge and a much better run defender than given credit for. Jeffcoat is the son of former Dallas Cowboys All-Pro defensive lineman Jim Jeffcoat so he possesses the NFL bloodlines that coach Payton & Spagnuolo value (Cam Jordan, Chris Long). While I feel Jeffcoat would be Spags second choice, the area in which the Saints will be selecting will determine if he might be the top choice. Meaning if we secure a high selection and Spags has Montgomery and Jeffcoat as a 1A to 1B rating… it’s conceivable that we could trade down, acquire a 2nd round selection and still land Jeffcoat later in round one. Like Quinn, Moore is an exceptional athlete coming out of the college ranks. The former OLB converted to RDE when A&M switched back to a base 43 defensive scheme this offseason and has adapted to the position with absolute ease. 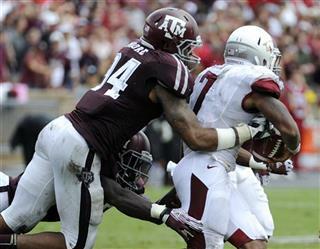 Moore is a natural pass rusher with speed and power who plays every down like if it were his last. His size is lighter than Quinn’s out of college at 6’4” 250lb but his frame can handle an additional 10-15lbs. Moore to me is one of this drafts best kept secrets heading into April. This is a prospect that could likely be had towards the end of round 1 or early to mid round 2 allowing the Saints to trade back and acquire additional picks from a team looking to move into the top 20. As I look at the possible outcomes of this draft process, the Saints moving down and getting more picks and using them on Moore and possibly A&M teammate OLB Sean Porter would give this defense two impact starters with speed, athleticism & tremendous pass rushing skill and that could be the ideal scenario in Spags view. Anyways… just random thoughts after watching Spags boy dismantle the undefeated Cards last night. PS: Anybody missing Jo-Lonn yet? Dunbar played well Thursday, in hindsight we could have kept him and not signed Hawthorne, but never mind. Rams got a good deal with Quinn, he was touted as a top 3 pick for a while but slipped down the board. We need that sort of luck next draft! My biggest fear with Montgomery is how legit is his pass rush? If we're drafting a DE, I'd like to get one who knows how to legitimately rush the passer. I don't want to draft someone and hope that they learn a pass rush under our guidance. He was made to rush the passer. He may have some troubles against the run in the pros, however. Maybe not though. Does he have a good arsenal of pass rush moves? I'm asking because I honestly don't have a concrete idea. Montgomery, like alot of these pass rushers have somewhat of a basic to slightly above adverage skill set as far as pass rush moves. What you see alot of times in college ball is when a player has so much athletic ability such as Montgomery he'll lack the aray of moves because he relies on his athleticism to win out. Only when a player lacks that elile athletic ability will he focus on expanding his counter moves because its whats needed to get him over the edge. Bottom line is... in the NFL, pass rushing skill can be tought, speed, athletic ability and burst can not. Couldn't have written it better myself. You can teach a man how to club, spin, swim, etc., but it only does any good if he has the athletic ability to pull it off. But out of the three ends listed above, i think having Damontre Moore would make the most sense for us. But my personal way of utilizing his talents would be a little.... different. The dude's fast. So, in running situations, i would have him at SLB, then i would have him at RDE in passing situations. I mean, if we play this offseason right, we can have a defense rivaling that of SF. Call me crazy, but i'm serious. That defense is so good because it can stop the run with a 6 man box. Moore could help us run a similar scheme. We have some very good DBs in Patrick, Quddus, Robinson, and Greer. We just need a return to form from Jenkins or a new safety, and then Moore or someone similar, and we would have a very good defense. 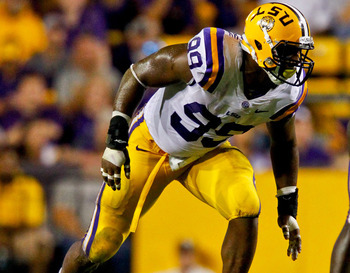 Just want to say, I really REALLY like Lavar Edwards from LSU. agreed... he could turn out to be a major sleeper! Would start for almost an other program. Definitely. He's involved in more plays than Mingo/Montgomery I think. Always disrupting the play somehow. What would you guys give up for Quinn? My first born son. Literally. For once... I think we might agree!